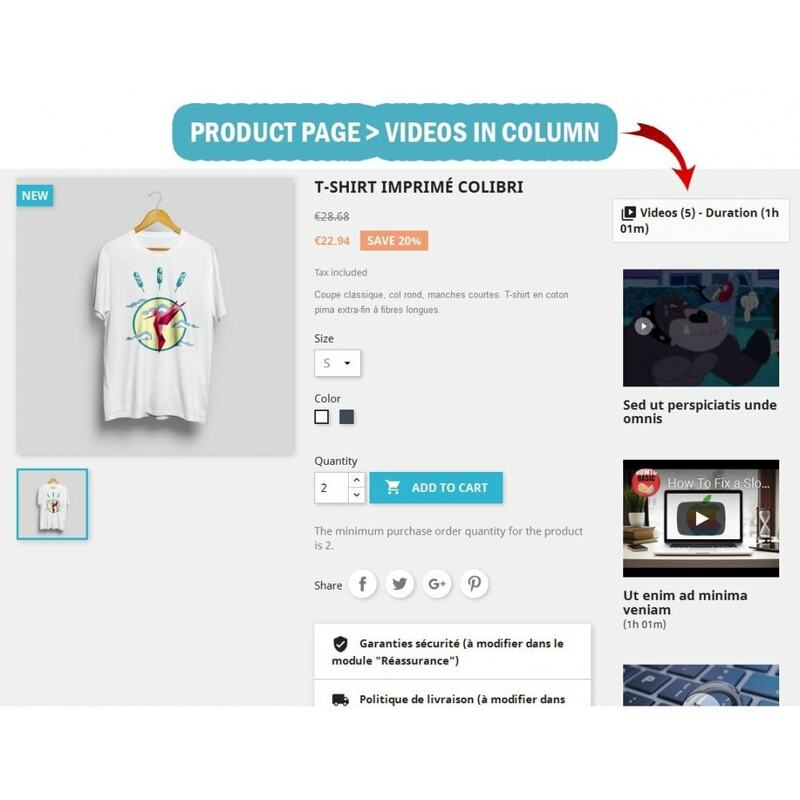 Enrich your product pages content with videos by using Youtube, Vimeo, Facebook, Dailymotion or any website that allow sharing embed code. You can also upload your custom video files in the most used formats. Tell a memorable story about a product or service and subsequently attract potential customers. Increase conversion rates as well as you will be able to increase the customer trust towards your shop. Increase visits number and so the sales number. Benefit from a fast, intuitive and completely AJAX interface saving you time and effort in managing your videos. 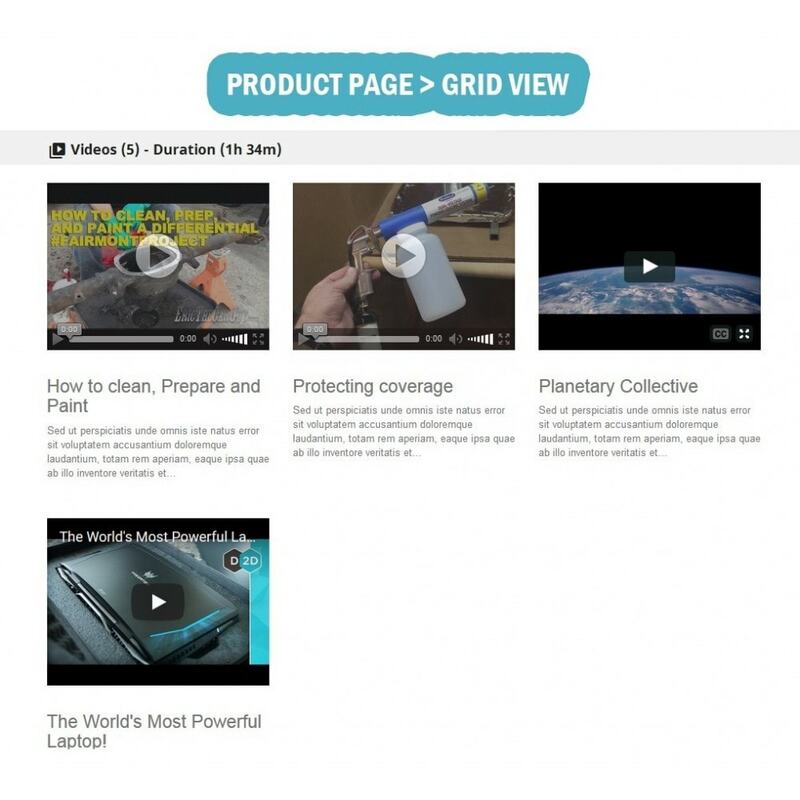 Add easily an UNLIMITED number of videos from your product page in a few clicks! You can add any embed video code (iframe) or direct link from external sources. You can upload your own video files directly on your server in the most used formats (mp4, flv, m4v, webm, ogg). Multi-uploads of video files is supported. Enable/disable, Edit, Change position, Delete existing videos. Possibility to define a title, short description, thumbnail/poster and duration for each video. 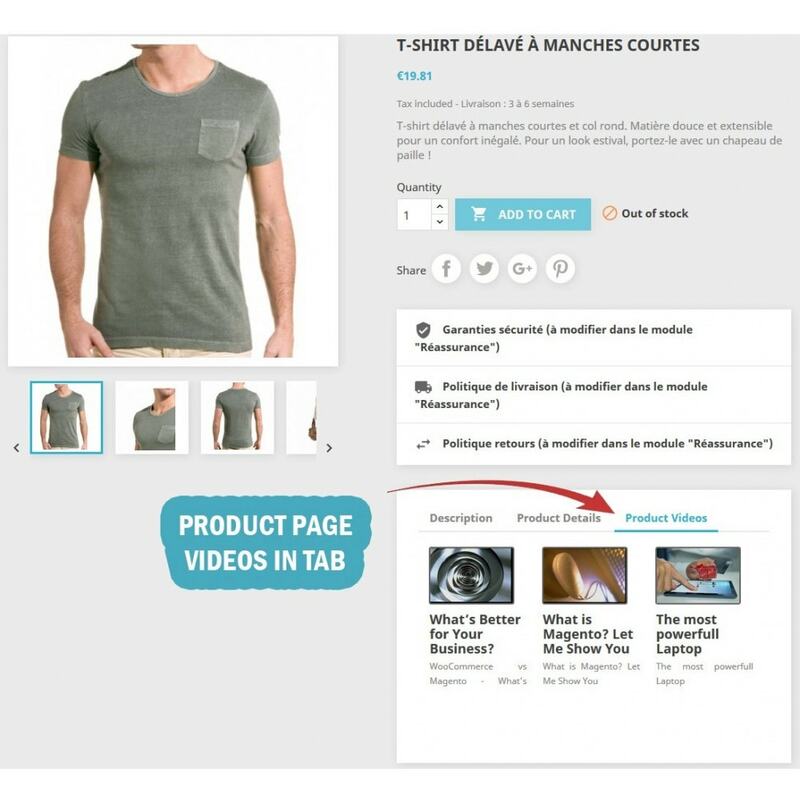 Product page: display in Tab, in Footer, in Column (left or right). 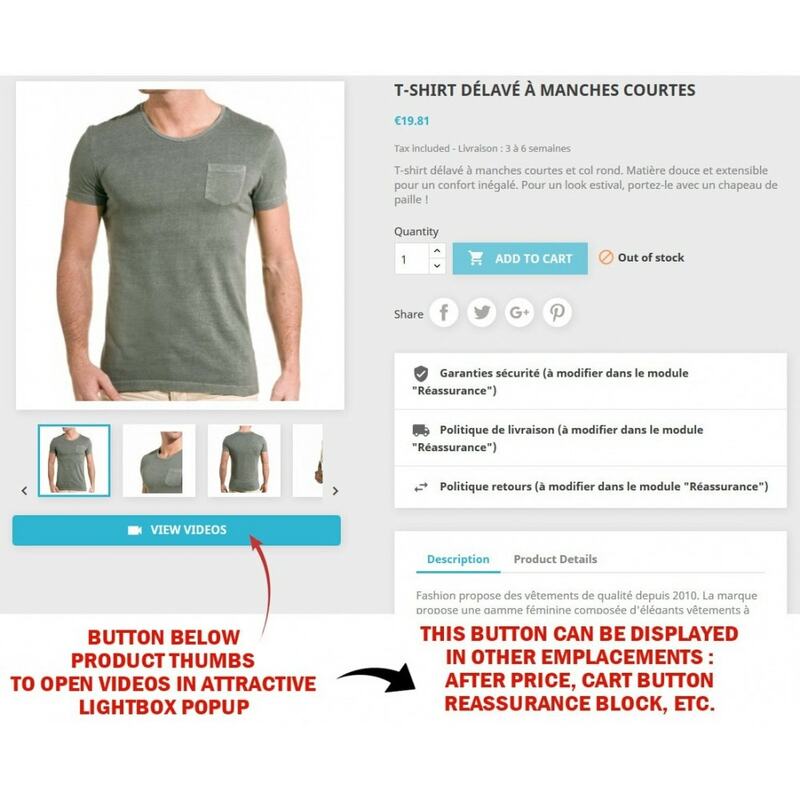 Product page: Display a button in different emplacements such as: Under thumbnails, After price, After cart button, etc. to open videos in an attractive popup. Ability to configure then display a Button/Icon on products listings, homepage tabs (best sellers, new products, etc.) to open videos in an attractive popup. Show button/icon also on search pages with support for our search modules "Wk Advanced search by categories" and "WK Products Search Plus". Disable hotkeys such as: CTRL+C, CTRL+A, CTRL+X, CTRL+V, CTRL+P, CTRL+U, CTRL+SHIFT+I, CTRL+SHIFT+K, etc. and shortcuts for developer tools and console of browsers such as F12, CTRL+SHIFT+c, etc. The videos are disposed as list or grid view but you can switch to Responsive Gallery View to make your videos more Attractive and Faster. Gallery supports touch and swipe navigation on touchscreen devices, as well as mouse drag for desktops. This allows users to navigate between slides by either swipe or mouse drag. 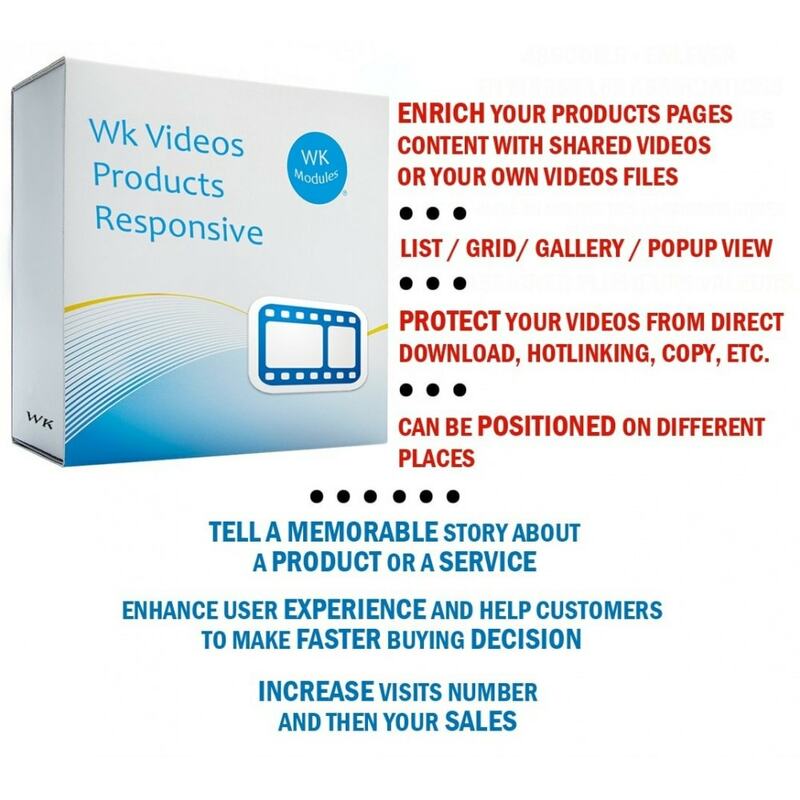 Provide for your visitors informations such as title / short description / duration that will appear alongside the video. Settings for: videos block title, Videos number, Total duration, Title and short description, List/Grid view, Flv player, etc. Settings for popup (Gallery mode): Auto play, Transition effects (slide, zoom, rotate, etc. ), Enable thumbnails, etc. 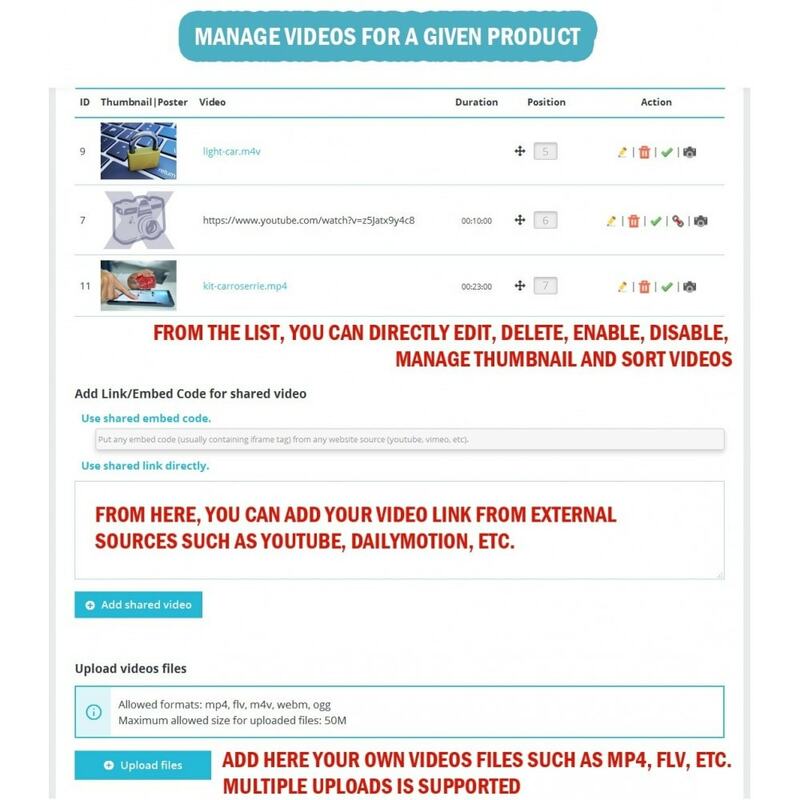 Automatic display of youtube, vimeo and dailymotion thumbnail from providers. Totally RESPONSIVE design (Responsive videos increase page usability on mobile). If you have any questions, problems with the module, click the “Contact the developer” button, we respond very quickly and will do everything possible to solve your problem as soon as possible. We also provide technical support. Enhance user experience to make faster buying decision. 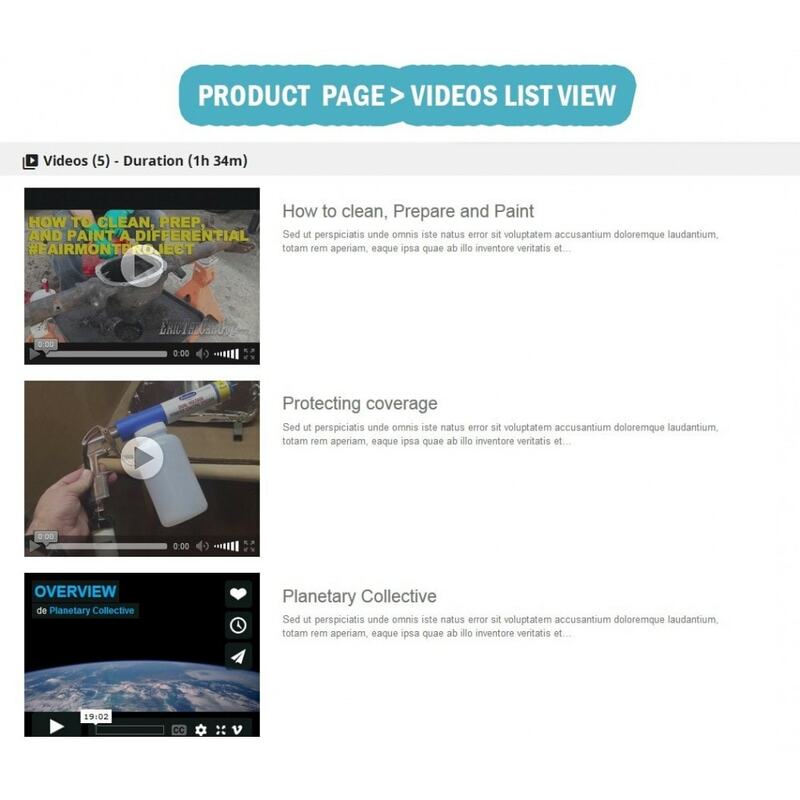 Saves time spent looking for product videos by giving customers easy access to demonstrations videos and reviews for each products. 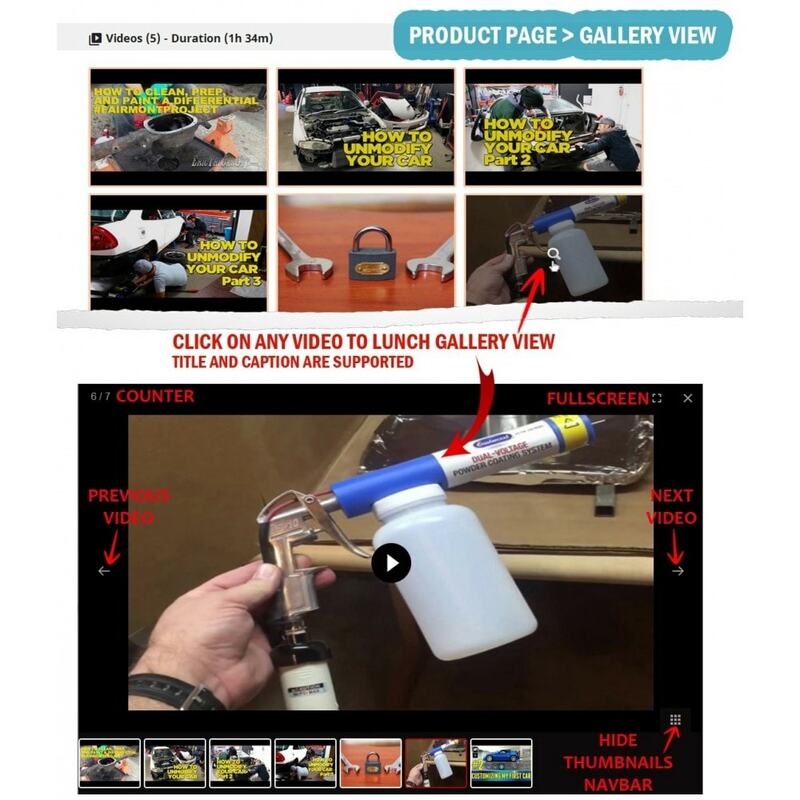 There is nothing better than seeing a descriptive video on how-to product can be used to convince a customer. Displaying thumbnails and playing videos in popup increase page performances. 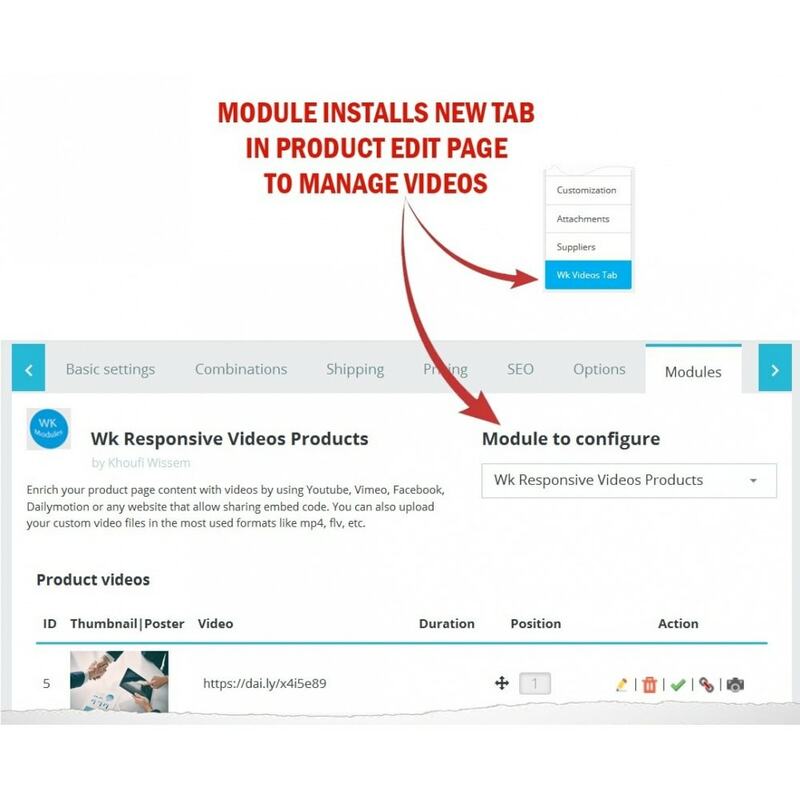 Add ability to show videos icons on homepage (best sellers, new products, ... tabs). 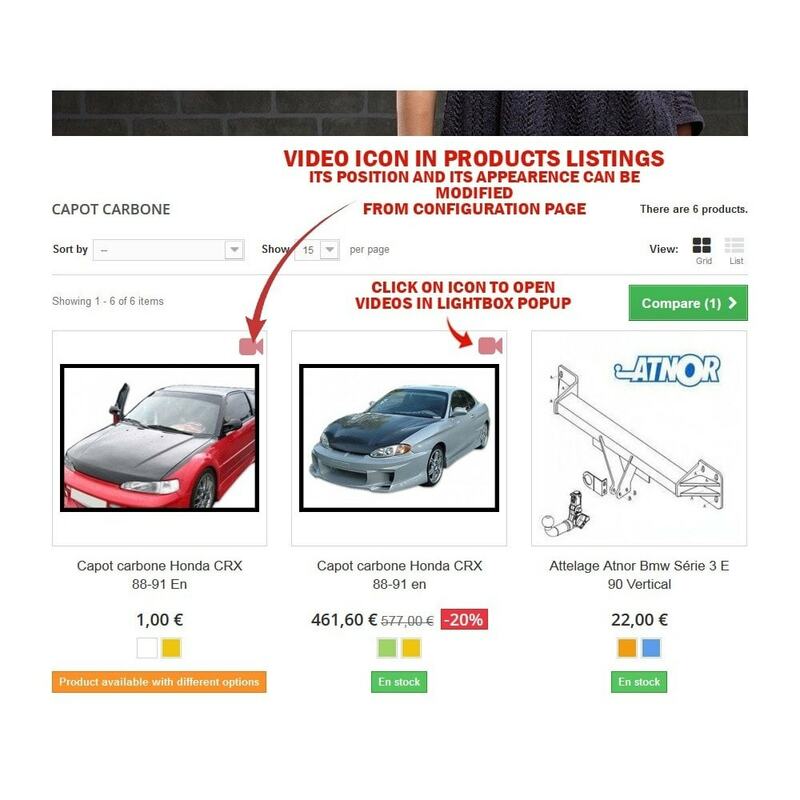 Add ability to show videos icons on prices drop and top sellers pages. Add ability to show the total duration allocated for all videos and per video. Add autoplay option for gallery mode. 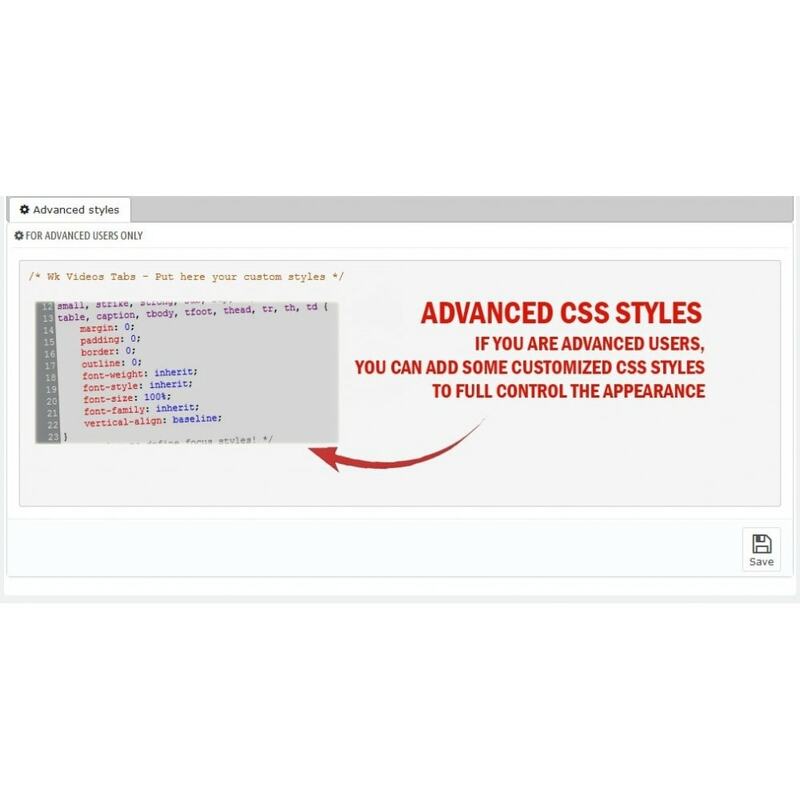 Improve code and css display and fix some bugs.